The Northeast HarborFest brings together fine artists and craftspeople from all over the country to the newly renovated Northeast Harbor marina waterfront for the Labor Day weekend at the peak of the tourist season on Mt. Desert Island. Northeast Harbor is a picturesque island village surrounded by luxurious summer homes and Acadia National Park. Artists can now combine two shows on the same visit by applying to the Bar Harbor Fine Arts Festival II which is held in nearby Bar Harbor the following weekend. 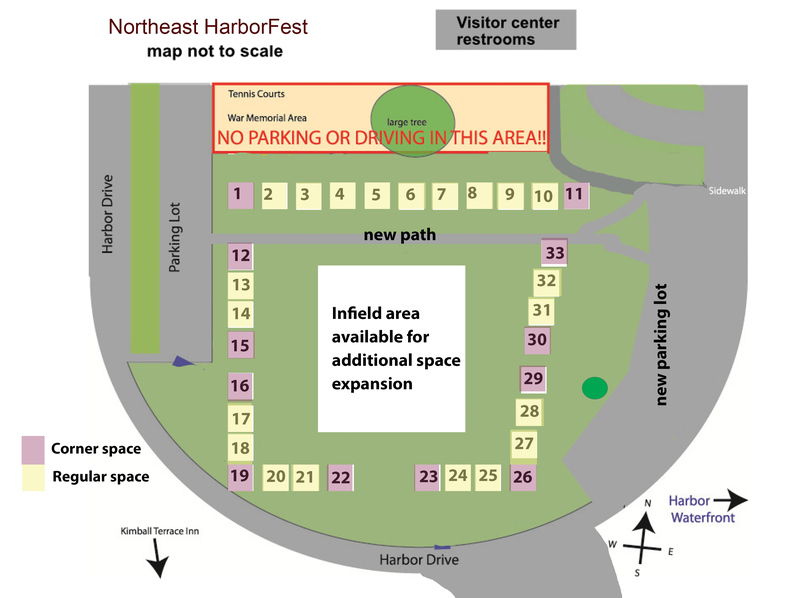 Now in it's 6th year-- the Northeast HarborFest is held on the grounds of Northeast Harbor's Marina Park next to the harbor and surrounded by beatiful gardens, homes and Acadia National Park. Each regular space is 10 feet in front by 10 feet on the sides with some space for storage between and/or behind booths. Work must be contained within the assigned space. Only one artist permitted per space, unless a two-person team qualifies as a dual entry, in which case both artists must be present for the duration of the show. Artists are required to set-up in the designated space assigned to them by the show director. Failure to adhere to the designated space boundaries may result in the artist(s) being required to reset their display or required to leave the show. Please note that all spaces must have white, 10 x 10 shelters with matching 4 walls for protection as the weather can change quickly and to maintain a professional appearance. Artists must exhibit and be present throughout the three days of the show as noted in the show schedule. Failure to comply with this rule may result in ineligibility for any awards and/or admission to future shows or may be grounds for dismissal from the show without any refund. Only artists displaying their own original work may participate. No stand-in or proxy exhibitors will be allowed to represent the artist. A driver’s license and/or additional photo identification may be required at check-in. Artists must comply with state law regarding collection of appropriate sales tax and file returns with the state of Maine. Stakes may be used on the grass spaces. Shelters must be sturdy (able to withstand significant wind-loads) white tent or dome type shelters with 4 white walls. No generators are permitted or music sources that can be heard beyond the artist's space (except music provided by the show). Battery inverter packs are allowed to power lights. Some spaces may have a slight slope so artists may need to have shims to level their displays if they need to. Artists may request specific space assignments and in most cases the show director will do his best to accomodate those requests. This is provided as a courtesy to the artist--buit is not a "gaurantee" that the artist will get the exact spot they request at the time of the show. Because of changing participant numbers, cancellations and other factors--the director may have to re-assign a space or move existing spaces around in order to adjust to the changes. Show director reserves the right to change participating artist space assignment if necessary with no compensation to the artist (however, the artist will still receive the space type that they paid for).